On June 25, 1876, George Custer and part of the 7th Cavalry charged into a Sioux encampment on the banks of the Little Bighorn River. The events that followed would become one of the most famous battles and most famous defeats in American history. Many people in this part of the country can go to a Civil War battlefield and know the details of what happened there. I can do that at Little Bighorn. I first visited the battlefield in Montana when I was a kid and have been back several times. However, it was not the event that first gained my attention. It was the white markers scattered around the landscape. At some point after the battle, marble markers were placed where soldiers had fallen. Some of them are not accurate, and they have since caused controversy. Native Americans have wondered where the markers for their fallen have been. In recent years, a few markers have been placed for killed warriors. This post is not about the inaccuracies or the controversy. It is about the effect. For me, the markers make the battle seem like it happened a few days ago. I can scan the battlefield and see where people fell. I can see where some made a stand and others died alone. I can look at the markers and see the battle in my mind. I can listen to the wind and hear the sounds of the fight. Civil War battlefields do not provide the same effect for me. I can study a battle and know the troop movements, but the land looks like a peaceful field. 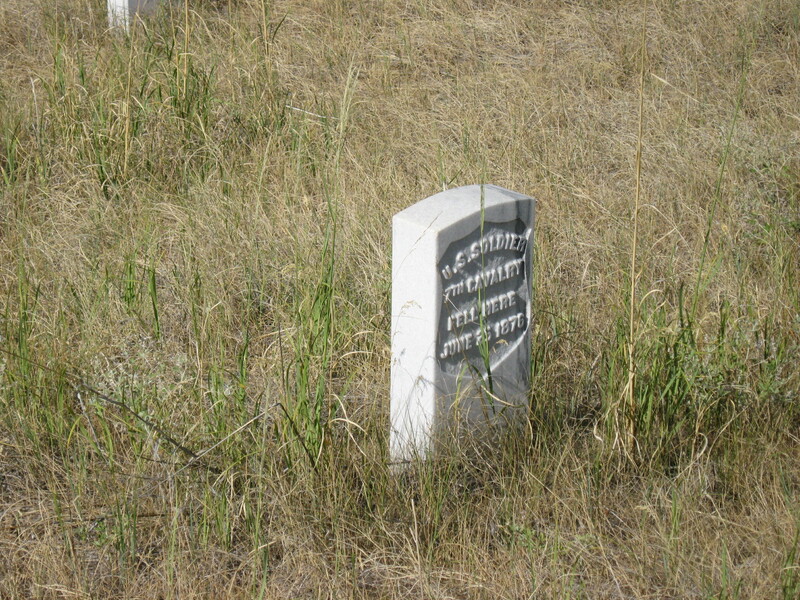 At Little Bighorn, the individual markers remind me that blood was shed on the expanse. A few years ago, I went to the battlefield with my dad, my brother and my nephews. We stood on Last Stand Hill, where Custer’s body was discovered, and my nephew filmed me talking about the battle. I looked over the landscape and pointed to where everything happened. I provided accounts from warriors and military records. It was a thrill to be able to do that on site. When I finished, I turned around to find a busload of people listening to me. Apparently, I had drawn a crowd. I answered a lot of questions, but I really wanted to tell them to look at the markers. They are why I have read so much about the battle. They are the genesis for why I studied the American West. For me, they are what makes Little Bighorn a spiritual place. A passion for history is a rare gift. Thank you. You’re welcome. History is something everyone should love. Good post. I was so close to the battle site in 1995 but the bus trip itinerary was not scheduled to stop there. I was so disappointed. Our own English Civil War battle sites are not so well preserved but then these battles were a long time ago. The Richard III society struggle to preserve Bosworth Field in Leicestershire but the truth is that no one really knows the exact spot where the King fell. About 25 years ago the Government built a major new road that was planned to go straight through the site of the battle of Naseby in Northamptonshire but protestors managed to get the route changed. We have a hard time with our battlefields. The only reason Little Big Horn is intact is because no one wants to build there. The Civil War battlefields are slowly fading away. What places did the bus take you? From Rapid City to Yellowstone via Mount Rushmore and then south through Utah and Salt Lake City and the National Parks until arriving at Monument Valley then a light plane to Grand Canyon. It was wonderful but I would like to do it again by myself and not have the bus tour itinerary restrictions and I would definitely make a detour to Little Big Horn. Those are all great places. Monument Valley is my favorite of the bunch. Interesting. the only Civil War battlefield I’ve visited (so far) is Gettysburg, which was incredible. I didn’t get a feeling of bucolic peace there though. At one point during the civil War, Custer asked Longstreet for the surrender of Lee’s army. I believe Longstreet laughed at him. I have not visited Gettysburg. The battlefields in this area are surrounded by development. That could be the problem. When Lee surrendered, Custer was given the table that the papers were signed on. That might be a tough place for me to visit – as they say that a place where blood has been spilt in battle still holds the anger and anguish of those who fought there. I believe there’s truth to that. And I also would wonder that what was the fighting was all about has really been resolved?… or that one side has merely been defeated. That issue at hand will never be resolved. One people took land from another. It has happened many times in many places. It will continue to happen. Indiana Jones without all of the danger. I hope that a pit of vipers is not in my future. We also have markers for leaders, but they really are not the ones doing to dirty work. History, like mythology, often suffers from one-sidedness. People like you, Rick, make it truly interesting because you try to present multiple points of view. It’s always a delight to read these posts. Thank you. I try to tell the complete story. Unfortunately, all historians are human and can’t get completely away from personal bias. Personal bias is inevitable particularly since one wasn’t there when events happened. Unfortunately history in school text is usually reduced to morality tales of good and evil. Sad, because history is such a fascinating subject.